"Don't understand: The Moose will probably use thousands of years to understand that the automobile is a natural enemy. 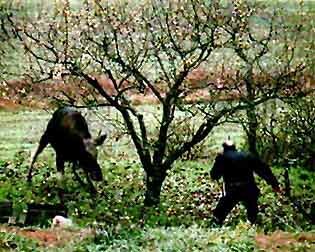 In 1996, 1142 moose were killed or put to death as a result of traffic accidents. The moose-accidents also take human lives and yearly hurts 100 drivers. The family that ran into this moose in Hedmark earlier this summer, came out of the ordeal mostly unscathed." "Every year, over 1 000 moose die on the road. 100 drivers are hurt, and and three are killed. The King of The Forest doesen't have the brains to stay away." It can take several thousand years before the moose's instinct registers that the automobile is a threat, says moose-professor Olav Hjeljord. The moose is not particularly smart. The sight of speeding cars don't scare it. On the other hand, if a jogger comes jogging along the road, the moose will run away. Inherited insticts tell the moose that the human is a predator classed with a wolf or a bear. Cars on the other hand, do not scare it, says Hjeljord. He is a scientist at Norges landbrukshøgskole [Norway's agricultural college] and has recently taken a doctorate on moose and moose grazing grounds. About 10 000 years ago, after the last Ice Age, the moose arrived in Norway. Ever since, humans have hunted it. And still we clearly remain its greatest enemy. During moose-hunt season, we shoot 30-40 000 animals, while the cars "only" kill about 1 000, the trains about 500. Instinct tells the moose that it has more to fear from humans than automobiles, the moose-professor says. Today's moose-stock is at about 1 00 000 animals. -How long time will the animal use to establish fear of the road? Hundreds of years, maybe thousands. The time perspective is not so interesting - within our future it will remain this way. The automobile has been here for 70 years and the moose has not learned. -What is the usual reason for moose-collision? Often the moose runs parallell to the road for a stretch. It will see the car, but is unable to gauge the speed and will try to cross in front of it. A usual reaction is then: "I never saw the moose". Hjeljord informs that moose-road-accidents happen year around, but with two peak seasons. In May/June, when the young calfs are driven away by their parents - and during winter, when moose congregate in the low lands to graze around trafficked roads. The heaviest versions of The King of The Forest can weigh over half a ton. On its long thin legs, the moose is a potential traffic bomb. Vegdirektoratet [the road dept.] have attempted several ideas, most of them failing: Large sums were spent on German poles [no pun intended] with reflectives that looked like eyes of predators. These were to be lit up by the approaching cars' headlights. A waste of money, says Hjeljord. High-frequency sounds on test cars have not been effective. Odor-bags of urine from wolf and bear have not been effective either. Clear roads and better lighting however have helped to an extent. -Now fences are being put up on all new highways. It will help, but will have a significant negative consequence that moose stocks are stopped and grazing grounds isolated, says Olav Hjeljord.